On the surface, the answer may seem quite obvious. However, the deeper meaning is one that we can all benefit from. 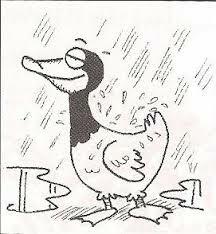 Believe it or not, one of the most powerful mental toughness strategies I teach is to be more like a duck. It’s a little known fact that ducks possess a special gland called the ‘Preen Gland’, which is near the tail area. This tiny gland produces an oil which the duck uses to coat its feathers. After picking up the oil with its head and beak, the duck proceeds to smear it all over its body to make the outer feathers waterproof. Without this protective barrier, a ducks feathers would become waterlogged. Put another way, it allows the duck to be resilient in the face of water. While humans certainly don’t have a ‘Preen Gland’, we do possess something far more powerful, which is our ability to manage our thoughts and emotions. While the ducks use their oil to become waterproof, we have the ability to use our minds to become bullyproof, negativeproof, pessimismproof, fearproof, and the list goes on. A duck spends most of its day surrounded by water, which makes waterproofing absolutely necessary. As humans, however, we spend the majority of our day surrounded by people, some of whom contain a tremendous amount of negative energy. Whether it’s at school, the workplace, or even at home, we are influenced by other people’s energy. The negative boss who continues to point out all that you are doing wrong. The pessimistic parent who models doubt and fear for his/her children. The rude co-worker who talks behind your back. Unfortunately, these things are commonplace. This is precisely where the mental toughness strategy of ‘being more like a duck’ comes in. While we certainly can’t control other people’s energy, we can control whether or not we allow their energy to enter our minds. Just as the duck uses the oil from the Preen Gland to create a waterproof barrier, we too can use our minds to create this same barrier. A barrier for any kind of energy that we don’t want to occupy space in our minds. In a previous blog, I shared a simple strategy called ‘No Vacancy’, which will help you to practice being more like a duck. Click here to read it. In closing, I have one piece of parting advice. The next time you are around Negative Nelly or Pessimistic Paul, remember this – You really can let their energy roll off like water on a duck’s back.